^ Naruto Spinoff Manga Boruto Launches on May 9. Anime News Network. [2017-04-10] （英语）. ^ 新浪游戏. 再战15年！《火影忍者:博人传》小说化 博人的新历程_八卦趣闻_新浪游戏_新浪网. 2017-04-02 [2017-04-15]. ^ Boruto Manga Gets Anime Project in April 2017. Anime News Network. 2016-12-17 [2017-02-23]. ^ Boruto: Naruto Next Generations Anime Reveals Promo Video, Key Visual, Returning Cast (Updated). Anime News Network. 2016-12-17 [2017-02-23]. ^ Boruto: Naruto Next Generations Anime Features Original Story. Anime News Network. 2017-01-26 [2017-02-23]. ^ 《火影博人传》官方：每期剧情都交由岸本齐史进行审核. aizhuizhui.com. [2017-04-15] （中文（中国大陆）‎）. ^ Boruto: Naruto Next Generations Anime Reveals More Cast, Staff. Anime News Network. 2017-02-23 [2017-02-23]. ^ 博人传火影忍者新时代 动漫 视频_播客_个人多媒体 土豆. www.tudou.com. [2017-05-08]. ^ Viz Media Licenses Boruto TV Anime, Plans Simulcast (Updated). Anime News Network. 2017-03-23 [2017-03-23]. ^ 放送局情報. 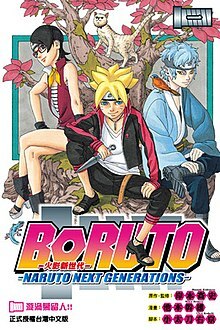 テレビ東京・あにてれ　BORUTO-ボルト- NARUTO NEXT GENERATIONS. テレビ東京. [2017-04-07]. ^ BORUTO-ボルト- NARUTO NEXT GENERATIONS. アニマックス. アニマックスブロードキャスト・ジャパン. [2017-04-29]. ^ Boruto Manga Gets Anime Project in April 2017. Anime News Network. [2017-04-12]. （原始内容存档于2016-12-17） （英语）. ^ 《火影忍者博人傳：新忍出擊》新情報 遊戲模式&人物戰鬥風格介紹. 香港新浪. 2017-06-02 [2017-06-03]. （原始内容存档于2017-06-03） （中文（香港）‎）. ^ 新浪游戏. 《火影忍者 博人传：忍者先锋》正式发表 忍龙团队操刀 打造全新在线多人忍者大战_电视游戏-新闻_新浪游戏_新浪网. games.sina.com.cn. 2017-04-10 [2017-05-09]. （原始内容存档于2017-06-03） （中文（中国大陆）‎）. ^ Boruto: Naruto Next Generations Anime Features Original Story. Anime News Network. [2017-06-01]. ^ 18.0 18.1 新浪. 从鸣人到博人，从岸本到池本——火之意志的继承与传承_国外新闻_南方网. cartoon.southcn.com. ^ 岸本齊史訪談爆料：為博人傳劇情畫死火影角色也可以 - iFuun. iFuun. 2017-05-10 [2017-05-27] （中文（中国大陆）‎）. ^ Japanese Fans Choose the Spring 2017 Anime Worth Watching. Otaku USA. 2017-05-07 [2017-06-01]. ^ #BorutosDad Is Actually A Thing Now. Anime. [2017-10-23] （英语）. ^ 《博人传》打戏涉嫌抄袭《美队2》？引起网友争议_电视游戏-新闻_新浪游戏_新浪网. 新浪网. 2017-09-14 [2017-10-11]. ^ 《博人传》抄袭《美队2》？迪士尼：已移交法务部门_八卦趣闻_新浪游戏_新浪网. 新浪网. 2017-09-26 [2017-10-11].